Two new 50m rimfire 40-shot group size records were set last week at the Eley test range in Fellbach (Stuttgart), Germany. This range employs an electronic target system that automatically calculates shot placement with great precision. The rifles are secured in clamping fixtures during testing. On January 21st, a new 13.2 mm record was set, follow by an even-better 12.4 mm record (that’s 0.488″). The previous record was 13.3 mm set in 2007. Before we go further, we need to explain how these 40-shot records are determined. The record is not 40 shots fired in one single, continuous string at a single target. Instead the record is based on the software-calculated “consolidated” group size of four, separate 10-shot groups. Software at the Eley test range is capable of over-laying four, 10-shot groups so they appear as one large “consolidated” group. These “consolidated” 40-shot group overlays have been recognized as new records. Here are the target images. The first row shows four separate targets. The second rows shows the consolidated overlay of 40 shots, along with consolidated score numbers. The first record was a 40-shot, 13.2 mm group (Score 426.7), which broke the previous record by 0.1 mm. The second record (using the same equipment) was a fantastic group size of 12.4 mm (Score 427.7), breaking the new record by 0.8 mm. Both records were set with Eley rimfire ammo produced in 2014 just 10 days before the test. Share the post "12.4 mm for 40 Shots at 50m — New Record at Eley Test Center"
PMA Tool Now Offers High-Quality Carbide Expander Mandrels. Responding to customer requests, PMA Tool is now offering carbide expander mandrels in popular calibers. These carbide mandrels are listed as .22, .24, .26, .28, and .30 calibers, but they are sized for popular chamberings in .223, .243 (6mm), .264 (6.5mm), .284 (7mm), and .308 (7.62mm). PMA’s new carbide expander mandrels will cost $56.95 per item. PMA also makes regular steel expander mandrels at a much lower price — $8.95. These regular Expanding Mandrels are designed to fit both the 21st Century Shooting and Sinclair Expander Dies. PMA states: “Our mandrels are longer than other expanding mandrels and feature a special dual taper which expands both on the up and down stroke of the press to more uniformly expand and straighten case necks.” These regular expanders are offered for all popular calibers, from .17 all the way to .338. Last but not least, PMA makes specialized “long-taper” expanders designed to expand 6mmBR brass to 30 BR brass, or expand 220 Russian brass to 6mm (for the 6 PPC). Priced at $9.95, these handy, effective tools make it easy to neck-up your brass for 30BR or 6 PPC. Share the post "PMA Tool Now Offers High-Quality Carbide Expander Mandrels." Greg Jordan is now $50,000 richer, and he can claim bragging rights as the top 3-Gun shooter in the nation. 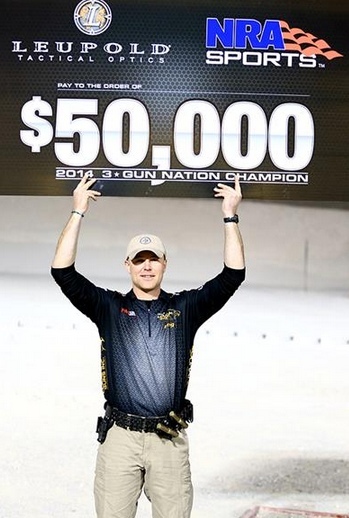 Jordan defeated ace shooter Taran Butler to claim the title of 3-Gun Nation Champion, taking home $50,000 from Leupold Tactical Optics and NRA Sports. The 3-Gun Nation Championship was held at the Clark County Shooting Sports Complex outside of Las Vegas, on January 15, during SHOT Show week. This final match culminated the 2013-2014 3-Gun Nation Pro Series Tour, where more than 50 of country’s top 3-gunners battled for cash and series points. Jordan completed what was arguably the most impressive 3GN Shoot-Off run to date, eliminating two past 3GN Shoot-Off winners, including the 2010 3GN Champ, a world champion Steel Challenge shooter, and a multi-time national handgun and 3-gun champion. Jordan navigated a minefield of talent — BJ Norris, Burton Thompson, Daniel Horner, and Taran Butler — to become the fourth competitor to earn the title of 3GN Champion. Lena Miculek won the Ladies’ Division in dominating fashion, followed by runner-up Dianna Leidorff of Team MGM. Lena, who earned a $25,000 prize, came into the event as the number one overall seed after sweeping the 2013 3GN Lady Pro Series, winning all four matches during the season. 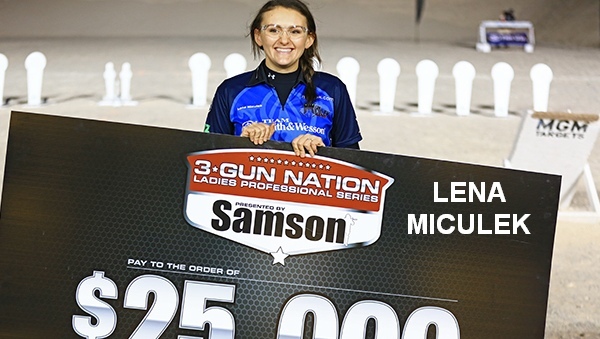 Lena’s back-to-back championships, in only her second season of 3-gun competition, rivals the accomplishments of her mother, Kay, arguably the top female 3-gunner in the sport today. For more info on the 3GN Final Championship in Las Vegas, visit the 3-Gun Nation News Blog. Share the post "Jordan Wins $50,000 Prize in 3-Gun Nation Championship"